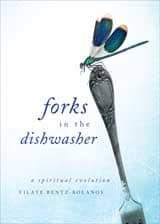 Forks in the Dishwasher is not what you think…it’s not about how to wash your dishes, or even about anything kitchen related…it’s about God or the Higher Power or whatever you personally want to call it… This book is much more than just about God, it’s about helping you learn and discover more about you! If you are looking for a bible teaching book, this is not for you. However, if you are looking for a non-denominational book that talks about a higher power while helping you to reflect, question, think about things more – then this is totally the book for you. I am not a religious person at all, but I believe in a “higher power” or whatever you want to call it. I believe in things being put in your path in order to learn something from it…I have had a lot of GREAT books put in my path thanks to Stacie! The book is not going to throw scriptures at you, or throw God at you…It’s more about how the author presents the information at hand. Each chapter ends with a few questions for you to reflect on and think about and a place for you to write notes if you are going to keep the book. (It is books like this I like to read and send on to someone else that might need it, with a note included.) I have a handmade journal I am using for a few other projects I am working on – so I am adding this one to the other books to keep everything for the books in one place. Before picking up this book – I struggled with a lot of things, yet by the time I finished the book….I feel much more at peace within myself, and know that I found exactly the perfect book for me to help me work through the other issues that I have. Forks is not a religious book, but it is one I would recommend for your summertime reading – or if you are looking at making changes within yourself. I just bought this book and read it in one sitting! It is so simple yet extremely profound. Thank you Vilate and Stacie for bringing it to my attention. Exploring the thought-provoking questions at the end of each chapter really helped me clarify my beliefs and I have to say my biggest “ah ha” was how to help let go of some of my judgements about people and different religions. I highly recommend this book.